Wapadsberg Guest Farm is nestled in the Sneeuberg Mountains, close to the Wapadsberg Pass with the altitude varied between 1381 m and 2076 m above sea level. Come and breathe the crisp clear air and experience life on a working Karoo farm, consisting of Dorper sheep, Savanna boer-goats, cattle and a wide variety of indigenous and exotic game. The guest cottage is situated next to the main house, on the slopes of the Sneeuberg Mountains, facing east with magnificent views of the plains below. The beautiful cottage offers three en-suite rooms and a living area. Experience our lovely clear Karoo skies at night from the lapa area attached to the cottage. The cottage is surrounded by a lush garden, with two extraordinary blue gum trees as a focal point. Be sure to pack your warmer clothes, as you might experience occasional snowfalls in winter. Our guest farm is a safe, healthy and tranquil holiday destination that will appeal to nature lovers and outdoor adventurers. 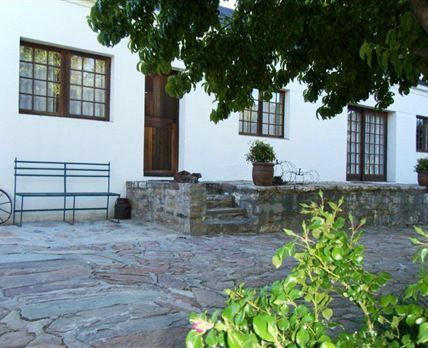 Come and enjoy farm life, warm hospitality, hearty breakfasts, Karoo suppers and comfortable accommodation. As we have no bar facilities you are most welcome to bring your own liquid refreshments. At Wapadsberg Guest Farm there are numerous activities that you and your family can enjoy. Depending on the season, you could even be fortunate enough to build a snowman. The activities include game drives, hiking trails, swimming, mountain biking, target shooting and birdwatching. Click here to enquire at Wapadsberg Guest Farm.